Managed 15 miles yesterday morning before anyone else got up, had an hour on my bike as I had to go to PC world for a cable, needed the exercise, and downloaded a good podcast last night, it was an hour long, so out to see if I could walk 5 miles before it finished. (yes, listened to the last 4 minutes at home.) So, feeling quite good, still feeling the knee, but it seems to ease when doing a race walk, i.e, landing on the heel on a straight leg, so maybe bent leg is putting more strain on it. the sciatic is still making itself felt when I set off, so still doing specialized stretches for that, but it soon clears when the muscles are warmed up. I'm here two weeks, got the Northern 20k on 27th, so it's out for some distance tomorrow, then mixing it up with distance, sprint/race walk training, and mountain sprints for cardio over the next few days. I have a ship sailing in the morning, on board at 6am, so it'll be clear by 9am, and probably nothing else during the day so I'll be out over the local hills again. Looking forward to it really, Hull seems so grey, flat and industrial compared with round here, although I'll miss Tigers v Norwich on Saturday, can listen on the internet. One point on a recent blog on the race walking, probably very relevent, and thanks for pointing it out. The body stays steady in comparison with its track through the air, whilst all the motion is through the arms and legs. So it's important to move the arms forward and backwards. This sounds obvious, but so many swing the arms outwards to the sides instead of forwards and backwards in line with the direction of travel. This has the effect of not only pushing energy out to the sides and therefore being wasted as it's not used to propel the body forward, but also means you have to move from side to side to counteract this, and therefore waste energy keeping steady. The arms, (in the words of my coach) swing backwards and forwards, not crossing across the front of the body, and the wrists should make contact with the top of the hips on each stroke. It's worth practising next time your out, and it does make a difference, saving energy and making your walk just a little quicker. Very tall horse, seen today. 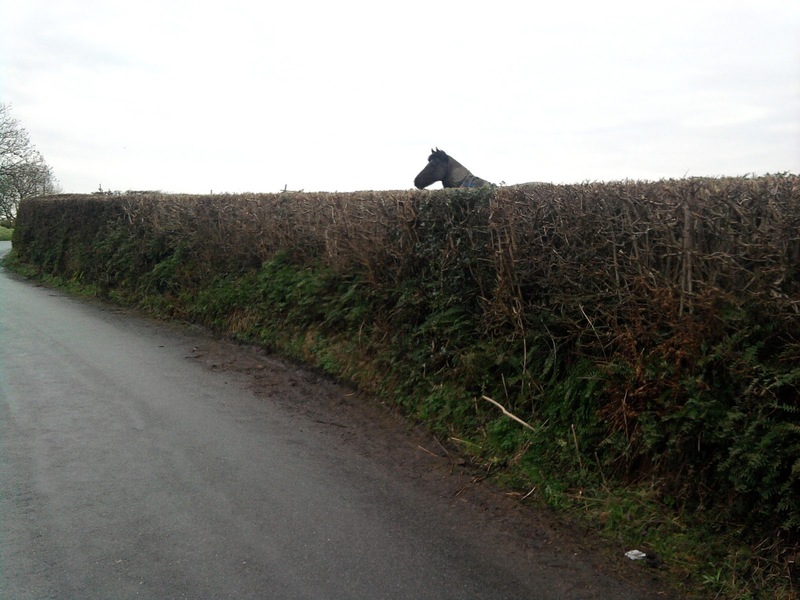 Specially bred to get over the jumps at Aintree?